Capstone Strategic announced today that PSCU, the nation’s leading credit union service organization (CUSO) has acquired CU Recovery and The Loan Service Center. With the acquisition, PSCU executes its strategy to expand comprehensive collections offerings for credit unions. Capstone Strategic Guides PSCU on Acquisition of CU Recovery and The Loan Service Center. Through understanding PSCU’s culture and values, Capstone helped identify the right partner that shares our commitment to member service and is aligned with our strategy for growth. 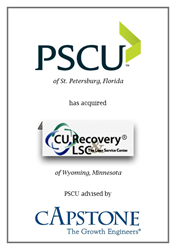 Capstone Strategic, Inc. (Capstone) announced today that PSCU of St. Petersburg, Florida has acquired CU Recovery, Inc. (CUR), a full-service collection agency, and The Loan Service Center, Inc. (TLSC), a first-party collection company. Capstone advised PSCU on the transaction. The acquisition allows PSCU to expand its collection services and provide a more integrated member experience. Founded in 1977, PSCU is the nation’s leading credit union service organization (CUSO) offering a comprehensive, highly integrated suite of payment solutions for credit unions to optimize their member experience. Headquartered in Wyoming, Minnesota and founded in 1990 by CEO Kelly Becker, CUR and TLSC provide two services for credit union clients. CUR is the leading full-service collection agency for credit unions offering a comprehensive suite of third party collection services and TLSC provides part time, full time, temporary, or permanent staff to credit union collection departments. CUR and TLSC will become wholly-owned subsidiaries of PSCU. “Through understanding PSCU’s culture and values, Capstone helped identify the right partner that shares our commitment to member service and is aligned with our strategy for growth. We are pleased to add CUR and TLSC to our CUSO, so we can provide a more robust offering and more integrated member experience,” said Jack Lynch, Chief Risk Officer at PSCU. “We are excited to offer a full line of debt recovery services to PSCU’s member owners. We see robust collections as integral part of the overall risk management strategy for credit unions, enabling growth while minimizing charge offs. As a third-party advisor Capstone, facilitated a smooth and successful transaction,” said Vel Davidov, SVP Finance and M&A at PSCU. “We are excited to be joining a team that has a strong commitment to member service and the credit union industry. Together PSCU, CUR, and TLSC will enhance our services for clients and future clients,” said Kelly Becker, CEO and owner of CUR and TLSC. “We are thrilled to continue to help PSCU grow through strategic acquisitions. With the acquisition of CUR and TLSC, PSCU will further its solutions for members and accelerate its growth. We have enjoyed our long-term partnership with PSCU’s team dating back to the call center acquisition of Digital Dialogue that has now blossomed into Total Member Care and are looking forward to the next chapter,” said John Dearing, Managing Director at Capstone. Founded in 1995, Capstone Strategic, Inc. is the leader in mergers and acquisitions for credit union service organizations (CUSOs). Established by CEO David Braun, Capstone specializes in strategic not-for-sale acquisitions and corporate growth strategies and has facilitated over $1 billion of successful transactions in a wide variety of industries. The firm has helped numerous credit union and CUSO leaders in develop, evaluate, and implement initiatives for growth. Capstone utilizes a proprietary process, “The Roadmap to Acquisitions,” to provide tailored services to clients in a broad range of domestic and international markets. Visit the Capstone website at http://www.CapstoneStrategic.com. For timely commentary and insights into the M&A market, please visit the Successful Acquisitions blog at http://www.SuccessfulAcquisitions.net. Capstone can also be reached at 703.854.1910 or Growth(at)CapstoneStrategic.com. PSCU, headquartered in St. Petersburg, Florida, is the nation’s leading credit union service organization (CUSO). Founded in 1977 as a credit union cooperative, PSCU offers a comprehensive, highly integrated suite of payment solutions for credit unions to optimize their member experience. Today, PSCU supports the success of nearly 900 Owner credit unions representing 20.4 million accounts. Leveraging digital technology, PSCU provides secure, best-in-class solutions including payment processing, risk management, analytics, loyalty programs, marketing, strategic consulting and mobile platforms. Comprehensive, 24/7/365 member support is delivered by contact centers located throughout the United States. For more information, visit pscu.com.